A Sunday Stash report isn't my norm, but I kinda wanted to document the 4 quilt shops I visited on vacation, and since I did, uh, imbibe, well why not? Plus it's always nice to give shops a little shout-out. Kerrie's Quilting, Lakeport, CA - A very small shop, though manned by the very pleasant owner herself. I selected a piece of the black and white Cotton + Steel typewriters since I'd run out of my previous-release typewriters, and they're one of those fabrics that I rarely know I need until I do, so they're nice to have on hand. 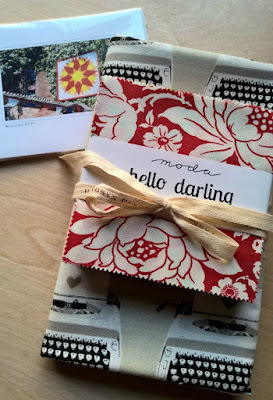 Then I grabbed a couple of charm packs of Bonnie & Camille's new Hello Darling, which daughter-dear and I like to use for random patchwork now and then. Plus there were packs of photos from the Lake County Quilt Trail that I wrote about earlier, so that was fun. 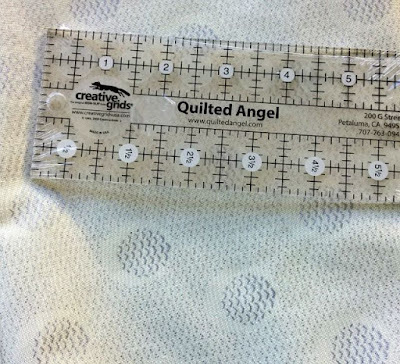 Quilted Angel, Peteluma, CA - Wouldn't you know, we happened upon this shop 10 minutes before their closing, but I quickly scanned the extensive fabric selection (can you say speed-walking? 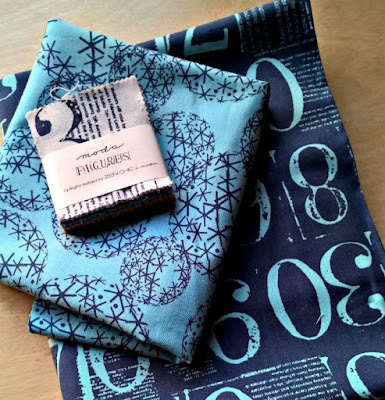 ), and after the clerk showed me a project she was working on, I chose to purchase the same background as she was using - a gray metallic print from the Steel Collection by Gerri Robinson/Planted Seed Designs for Red Rooster Fabrics. I really like to keep 2-3 yard cutsin my stash for backgrounds on a whim. The clerk also mentioned that the shop had an exclusive Creative Grids ruler (2.5"x6.5"), and it sounded too useful to leave behind. Cloth Carousel, Winters, CA - After perusing the whole shop, I finally took some of Pepper Cory's peppered cottons to the cutting table, choosing some fog (light gray) and midnight (dark blue). It was as I was paying that the clerk and I started discussing the pincushions in the impulse-buy section right near the register, and I randomly asked her if she knew what was in the little strawberry pincushions used to sharpen needles. 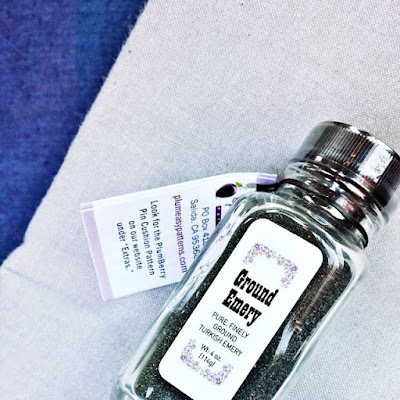 Of course she did, and led me back to the small jars of ground emory, which I couldn't resist purchasing as well, and I'm be back to say more on that later. Sewn Loverly, Wilsonville, OR - I really thought I'd seen my last quilt shop on vacation, but I found hubby had looked one up in the town where we'd spent our last night. The website claimed a stock of both traditional and modern fabrics, and even so I was pleased at how may of my favorites I found on their shelves. Funny thing. Almost every time I pulled out a new-to-me bolt to see what it was, it was Zen Chic Figures, which is last year's line but I guess I'd never seen it up close. So I used the excuse that my stash is low on blue (actually it is!) and chose a couple of prints, plus a mini charm pack for the paper-piecer in my life. So I came home with some goodies, created a new project idea for myself with that emery, plus made some fun connections. Good times. The Figures blues are stunning, I really wish I had an excuse to stash some of those! Great fabrics - love the Figures and those cute typewriters! OH!!! You bought some great fabrics!!! Sounds like a great trip and you bought some nice things too. I love Zen Chic! How sweet of hubby to look up the shop for you! I have never heard of ground emory. I will look for it now though. Sounds like something I need for my pin cushions. You visited two of my favorite quilt stores (Quilted Angel and Cloth Carousel), both within easy driving distance for me (we don't have a local store any longer, it closed down a few years ago, not because business was bad, far from it, but because the owners wanted to do other things). And now that I see your purchases, I may well have to plan a trip to both of them. Sounds like a successful trip to me. Enjoy your new treasures. I hope you ate at the Buckhorn, Putah Creek Cafe, or Tomates while you were in Winters! My dad lives there!